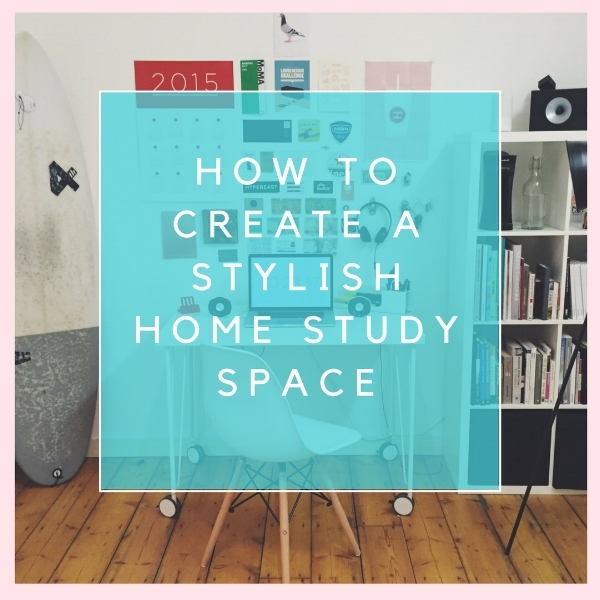 Now that we've covered the most important aspects of a home study space, let's get to the fun part! Outside of ample lighting, ambient sound and appropriate temperature, creating a stylish study space for your little one is an entirely creative and individual process, but these tips can help provide a little structure for your kid-smart home! Kids may not inherently want to study, but creating a positive work space can change that up! Hang photos of your student enjoying herself, on family vacation or at a birthday party, in your home study space to associate learning with positive emotions. Home is a place for relaxation and nourishment, but it can also be a place to learn and grow in education. To facilitate this, be sure to differentiate your child's learning area from the rest of the home, even if it isn't a separate room. Putting up dividers, using color to separate the workspace or adding wall shelves serve to remind your little one that time in the learning area isn't time to play, sleep or eat. Take care that you don't create your perfect learning space, but one that your student identifies with. It's easy to let our decorating instincts take over, but be sure to let your little one choose a few items of decor or his supplies, so that he feels like part of the process and is left with a space he enjoys too. No one wants to learn in a cold, boring environment, including you! Help your little genius out by getting creative with this learning space and building a fun, pleasurable, even adventurous place for homework and studying. Once again, this is a project to share with your student. Since she'll be spending the most time there, it's important that it reflects her interests, and not yours. Is she a softball star? A Star Wars fan? Put a little touch of your genius's personality into the study space. After all, that's what you love about him! Parents may or may not realize that, while summer break can be an excellent refresher for students of all ages, it's also a tricky time for retaining skills learned during the school year. Studies show that over a typical 3-month summer vacation, students in varying grade levels can lose as much as an entire month of learning! We think there are ways for kids to enjoy summer just as much and still hold on to the eduction they've picked up during school months. One great way? Gardening! Summer gardening can be an excellent way to stimulate thought and creativity and help to maintain an atmosphere of learning (albeit a secret one) even outside school hours! Plus, interacting with nature has been proven to enhance mood, health, productivity and more, and gardening keeps kids busy and active! It's a win win! Here are our favorite ways to work a little summer education into the fun of gardening. Making any (or all) of these activities a part of your child's time in the garden can help combat the summer slippage that comes with taking some time off. You can also use this list to kick start your own creativity and think of even more ways to help your little one retain that knowledge. Then share with us! Don't forget to also enter our #SummerReading giveaway for a free kids' book of your choice! Our Top 5 Books for Summer Reading + A Giveaway! You may have noticed, through reading along or following Kid-Smart Spaces on social media, that we're pretty huge fans of summer reading. Reading is an amazing way to quietly pass the long summer months, especially when friends aren't available for play dates, and it also benefits children of all ages immensely, through improved vocabulary, general knowledge, grammatical flexibility and much more. We pretty much love all books, but these five top the charts for best summer reading material this year. Take a peek and see if you agree! With the follow-up to his debut book, Chocolate Me, actor and father, Taye Diggs continues to help children understand and deal with the unique set of questions that arise as part of an ethnic identity. Having already addressed what it's like to be a young, black child, Diggs has moved forward with Mixed Me, dedicated to his bi-racial son, to give mixed children something to identify with and a positive role model for accepting and being comfortable with who they are. With his main character, Mike, in Mixed Me, Diggs not only helps bi-racial children through what can be a tough growing period, he also provides an incredible example of of self-love, acceptance and optimism in the face of adversity, teaching not only children, but parents as well that it's absolutely worth it to be proud of who you are. Chances are, you want your children to make good decisions, know how to share, respect others, and have good values. It's a dream come true for most parents, including Jeremy and Janel Miller. The two parents of three boys decided to write a book after seeing that there were not enough books on the market to help teach children how to have exhibit good behavior. Role Model Ricky's Big Birthday Bash is their answer to this lack. Jeremy may be a Minnesota State Senator and Janel may work full-time, but instilling good values in their children from a young age is something these two parents clearly value, for both their sons and many other children. We're increasingly living in a world where children are no longer taught to nurture their dreams, since they aren't tested and measured. For Lynea Gillen, this is a message worth disputing. The Portland yoga teacher and licensed professional counselor has been writing for and sharing her love of literature with children for over 30 years, and Little Banty Chicken and the Big Dream is the newest in her effort to bring dreaming back to childhood. With a heartfelt message, this beautifully illustrated book teaches children the importance of dreams and how sharing them can lead to discovering ways to make them come true. With the help of barnyard animals, children and their families, kids learn how beautiful, important dreams turn into actions that ripple out toward the creation of positive outcomes. If there's anything better than summer reading, it's being genuinely happy! Grammy winning musician, Pharrell's 2014 hit, "Happy" had adults and kids around the world tapping into their happiest moments, and his hardcover picture book of the same name translates that into still images and picks up where Pharrell's music video left off. With so many intense things going on in our world, it can sometimes be easy for little minds to lose track of the joy of happiness. Happy! serves as a beautifully composed and photographed reminder of what it means to be happy, something we could all use a little more of! Asthma Is Not Stopping Me! This upcoming book is the latest release in Emergency Room Physician's Assistant, Tolya L. Thompson's award-winning Smarties Books Series. Thompson and her Smarties Books Series are dedicated to bringing kids useful information about staying healthy and out of the ER in a fun, interesting way they can understand, all the while promoting literacy. For Piper Lee, the book's main character, asthma might be an issue she has to deal with, but she's not letting it define her. Through Asthma Is Not Stopping Me! and other health-oriented books, Thompson has created a very effective and valuable approach to opening dialog on coping with asthma in a way kids can understand, teaching children how to conquer asthma and be unstoppable! Each week's winner will win one of the three books! To enter, get to know us on social media by following or liking the Kid-Smart Spaces Facebook page, Twitter, Instagram feed or all three! Then just share your details with us to confirm, and cross your fingers! Summer is here. We made it! Take a few seconds to pat yourself on the back, whether you're a student or teacher, for making it through another school year! As far as we're concerned, the best part about summer isn't hot dogs, flip-flop weather or the beach, even though all of those are great. The best part of a kid-smart summer is so. much. time. for reading! These authors, leaders and all-around awesome readers get exactly what we mean. What are you and your littles looking forward to reading this summer? Please share in our comments so others can read your favorites too!